Thinner and cleaning agent with natural Citrus fragrance. 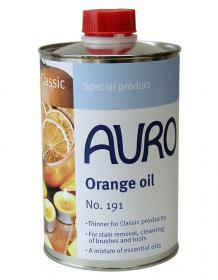 Suitable for diluting all AURO products from the PurSolid and Classic product ranges and for cleaning paint brushes and tools after use. Excellently suited as stain remover and as scented oil. (Former product name: "Thinner").